Learn more about us and our methods below. Want to know more about our tutors? Check out our tutor bios. Want to know what others have to say about us? Check out our testimonials page. Don’t see the answer to your question below? Please contact us. How long does it take to show improvement? Typically, your child will start to show improvement after three months. At that point, you’ll see a clear difference in his ability to learn vocabulary, understand reading, and write essays. We use WordSilk, our proprietary vocabulary learning method. For a demonstration, set up a diagnostic and free trial lesson. How much homework is assigned each week? We are happy to increase the homework load if families wish. But we find that this is the load that works best for Silicon Valley students. As your child improves her reading and writing, you will notice her learning more advanced vocabulary words, reading more challenging books, and writing more sophisticated essays. Can you offer help with school assignments? Yes! Each week, we expect your child to write an essay or part of an essay. We’re happy to make the assigned essay a school assignment. Many of our students have taken advantage of this option to raise their essay grades. Does your program help with SAT? Yes! The SAT tests general English ability. All work that students do with English helps to prepare them for the SAT. If your child’s English skills are strong, SAT prep will take no more than 4-8 weeks. Some of our sophomores have received perfect or near-perfect SAT scores. Can you help with AP English classes? Yes! Our tutors are familiar with the requirements for AP English and ready to teach students how to read and analyze advanced texts. Yes! Throughout the year we offer small group classes for children in 4th-7th grade. In the summer we offer classes on SAT reading and writing. Please contact us for a list of current offerings. Yes! Our entire program can be taught online using a standard video conferencing program and Google docs. Most of our clients are school-aged children from 5th-12th grade. A few of our students are Silicon Valley tech workers looking to improve their reading and writing for management positions and MBA programs. If you tell us your specific needs, we can recommend a suitable program for you. How long does the typical student stay with you? The vast majority of our students stay with us for years. As students grow older, reading and writing assignments become more complex. 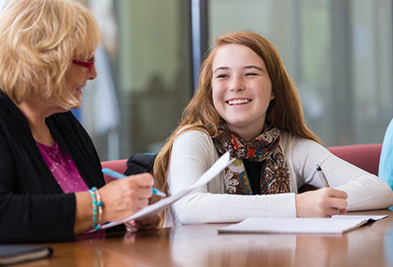 Our tutors can help your child continue to develop and succeed through high school graduation. Some of our students continue to work with us through college. FOUR LESSON MINIMUM FOR MONTHLY RATES. ONE TIME ENROLLMENT FEE OF $270.00.